“I like to research on the function of daily objects, and subjects concerning the archetypes of jewellery, especially the pin of brooch. The pin attracts me a lot as it involves mechanical movement, function of connection, hardness of the substance, the motion of sharpening the pin, and wearing. I take jewellery as the way to explore the relationship between objects, and as the reason to connect objects together. 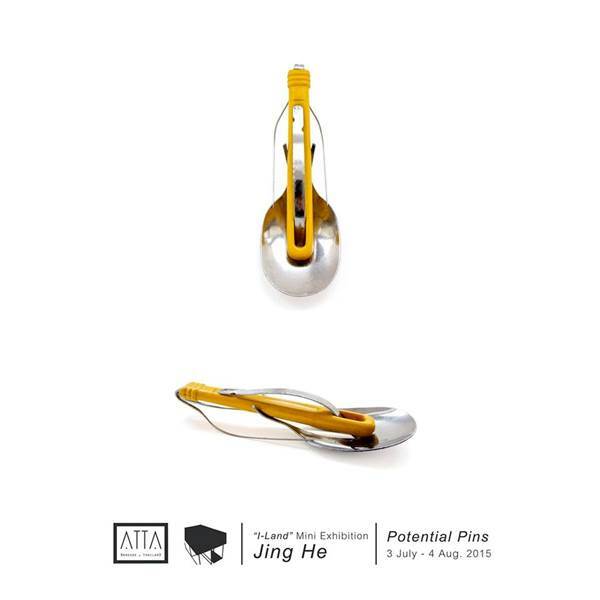 In the collection Potential Pins No.1-No.4 (2014), to be a brooch (to be wearable) is the main reason to connect iron nails and plastic measurement spoons together. I split the iron nail and sharpened it into the pin, which can be attracted by the magnet inside of the plastic measuring spoon. My intent is to search for a simple and functional way of constructing, and to present a different perception! of viewing and using mass-produced objects from our daily life. Jing He was born in Kunming in 1984. She was educated at the Central Academy of Fine Arts (CAFA) in Beijing before leaving the People’s Republic of China for The Netherlands to study at Gerrit Rietveld Academy in Amsterdam. She is currently pursuing her Master’s Degree in Contextual Design at the Design Academy Eindhoven, Eindhoven, The Netherlands. The award winning young artist has participated in many group exhibitions internationally and her work can be seen in a few publications.